Carpal tunnel syndrome occurs when the median nerve, which runs from the forearm into the palm of the hand, becomes pressed or squeezed at the wrist. 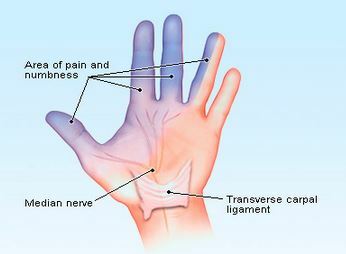 The median nerve controls sensations to the palm side of the thumb and fingers (although not the little finger), as well as impulses to some small muscles in the hand that allow the fingers and thumb to move. The carpal tunnel - a narrow, rigid passageway of ligament and bones at the base of the hand - houses the median nerve and tendons. Sometimes, thickening from irritated tendons or other swelling narrows the tunnel and causes the median nerve to be compressed. The result may be pain, weakness, or numbness in the hand and wrist, radiating up the arm. Carpal tunnel syndrome is often the result of a combination of factors that include trauma or injury to the wrist that cause swelling, such as sprain or fracture; overactivity of the pituitary gland; hypothyroidism; rheumatoid arthritis; mechanical problems in the wrist joint; work stress; repeated use of vibrating hand tools; fluid retention during pregnancy or menopause; or the development of a cyst or tumor in the canal. In some cases no cause can be identified. Misalignment in the spine could contribute to symptoms of carpal tunnel syndrome, therefore, chiropractic therapy is generally a relatively safe and noninvasive treatment for carpal tunnel syndrome. It helps by reducing inflammation around the nerve area, hence, reducing the pain. Various modalities may be used such as joint manipulation or mobilisation, massage, stretching, trigger point therapy, splinting, rehabilitative exercises, ice and heat.